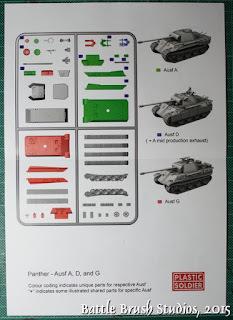 Today I'll have a closer look at PSC's 15mm Panther tank kit. I meant to post this one last year, but it got a bit delayed, so bear with me on the '2015's on some of the pictures. 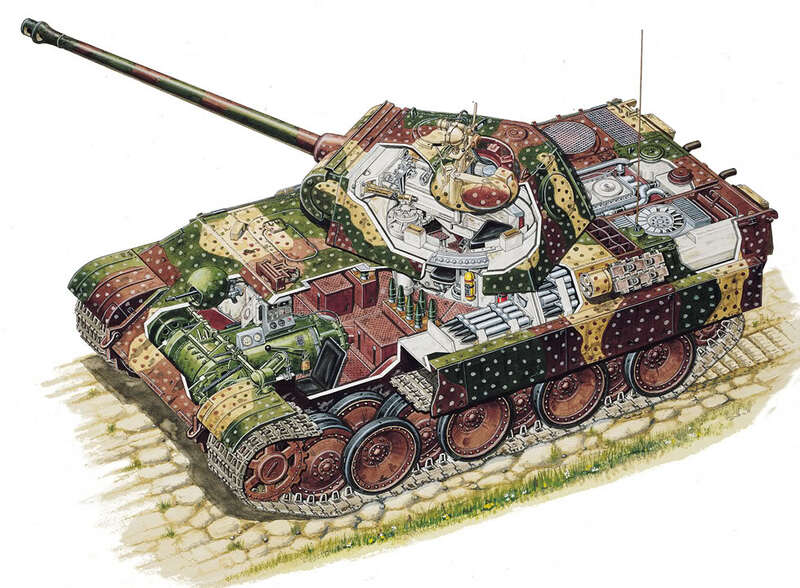 The Panther is one of those extremely popular German tanks of World War 2. This is not only due to the notoriously clever marketing of the Third Reich and people who sell things nowadays, but also because the Panther marked a big leap in German tank design. As so very often, crisis is the foundation for such a development. This crisis was the T-34 showing up on the Eastern Front in large numbers and the German main battle tank Panzer IV just couldn't really compete, despite best efforts to keeping it up to date with constant improvements. The T-34 was an incredibly modern tank design at the time. 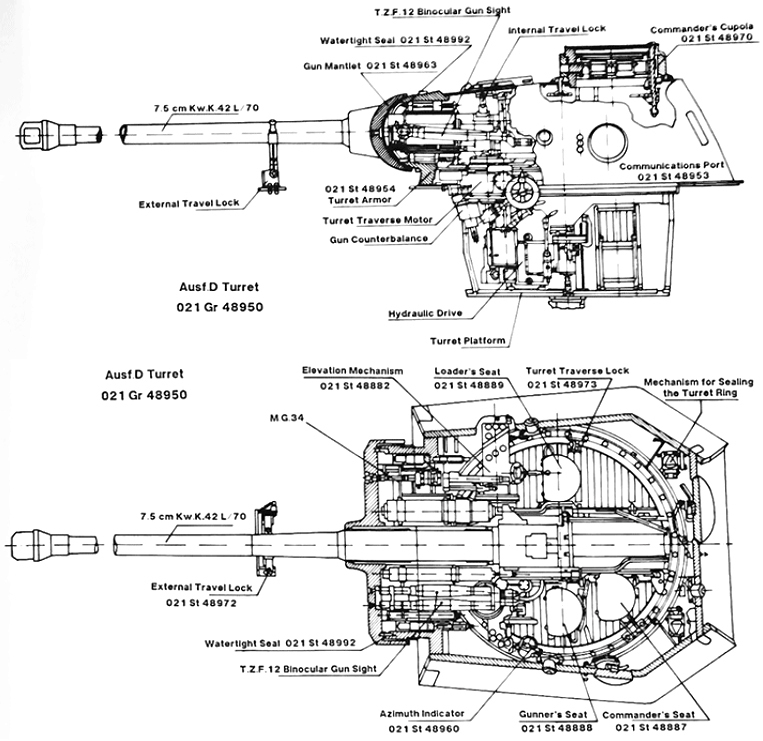 In the way it struck a balance between firepower, armour and speed at this point all German tank design efforts were driven by the goal of surpassing the T-34 and creating a match for it. The army called for a completely new tank to compete with this new threat. Original plans for the Panzer IV's successors were scrapped and a new vehicle was designed. Gone were the 90° angles in armour plates and some pointers were taken from the T-34's hull and turret designs. To add to the tank's defense the welded steel plates were also interlocked for additional durability. Due to constantly changing orders in terms of armour and firepower the Panzerkampfwagen V (nicknamed Panther) became too big for a medium battle tank for which it was originally designed. Over the design process the weight changed from 35t to finally 43t. In November 1942 the first Panther tanks (Ausf. D) were hastily shipped to the Eastern Front, against protests by staff and industry. The challenges of armour, firepower and speed were solved extremely well on this vehicle. However the rushed commissioning showed in various bigger and smaller problems, especially concerning the transmission and propulsion, which both were working at the limits of their capabilities after the weight had been increased several times. Still, several vehicles were sent off to joint Operation Zitadelle (Battle of Kursk). The bulk of them never even reached the battle due to technical failures, nullifying the immense firepower and general value of the vehicle for pretty much the whole first production series. The Panther required a serious overhaul. In 1943 the second production version Ausführung A was produced at several different factories across Germany with the highest production priority. See what they did there? Starting over again with the lettering of the Ausführung (Mark)? It was basically a product reboot, not even caring about possible future wargamers getting all confused about Ausf.A coming after Ausf.D! The most obvious differences were the added hull MG for the radio operator, added 5mm armour Schürzen on the sides, a simpler commander cupola with an anti-air MG added on some vehicles. 1768 vehicles of Ausf.A were produced until 1944. 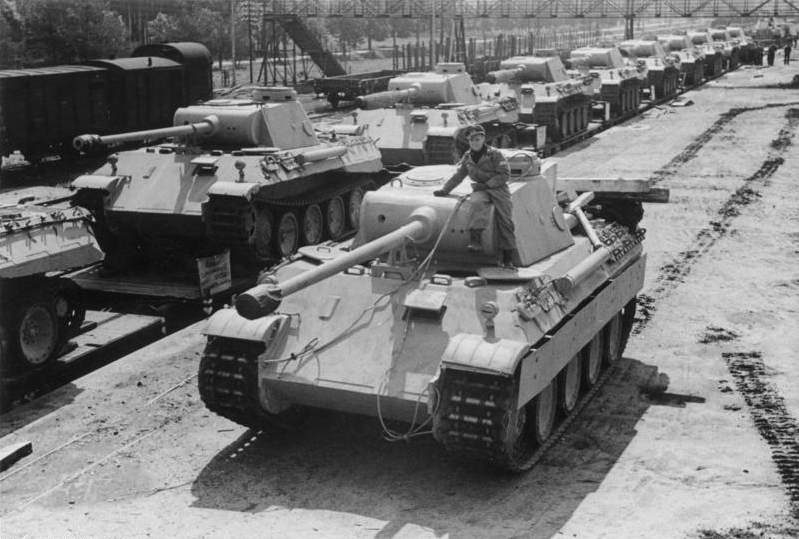 In 1944 a new version of the Panther (by then the name Panzerkampfwagen V was officially changed to just "Panther"), Ausf.G, commenced production. Overall it was very similar to Ausf.A, but the driver's vision slit was removed (and replaced by a periscope) and the hull got a slightly simpler and more economic design. The Panther probably was the most well-designed German battle tank of the war, combining German engineering and high tech with a few pointers taken from Soviet tank design of the time. The Panther's front armour proved excellent until the emergence of the new type of heavy Soviet tanks, namely the IS-2. 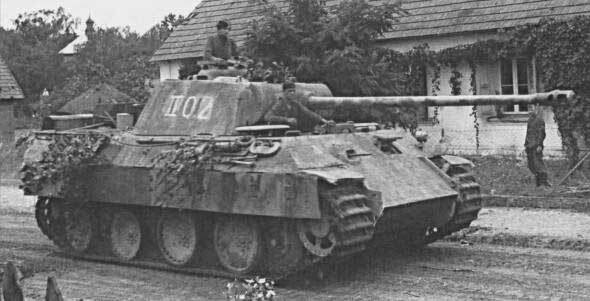 The side armour was much thinner, leading to Panzer IVs being used as flank guards for Panthers on many occasions. The red army saw the danger of the new German type, but already after they encountered the Tiger earlier they had started to work on tanks with larger calibre guns. While even the T-34/85 was surpassed by the Panther in terms of overall performance later types became a problem for the Panther tank. The British took the new German tank type very seriously. After they still struggled to keep up in terms of armoured vehicles this new leap was a serious danger of them falling behind again. The United States at first took the Panther for a heavy tank for which the German arms industry wouldn't have the resources to produce them in larger quantities. Only after the Normandy landings they realized that there were a lot more Panthers around than anticipated and especially the excellent Jagdpanther version proved to be a huge problem. Only after the Battle of the Bulge calls within the US army led to serious endeavors in speeding up the introduction of heavier tank types. Now let's have look at that box full of nice plastic models, shall we. This must be the biggest PSC box I ever saw. 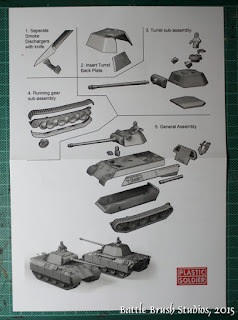 If you are familiar with them you will know that this means that this one is about the size of or slightly larger than those boxes 28mm plastic tanks come in. The reason for the bigger box is that you get a full platoon of five tanks. The front artwork shows two Panthers (Early Ausf.G I presume. Hull MG, Schürzen, no driver vision slit, but still that 'bullet trap' at the bottom of the turret.) probably in Western Europe. It's the usual PSC box design, with that golden "Finest Quality Assured" badge which always reminds me of the Nintendo Seal of Quality. The back of the box has the usual basic painting guide. Always amusing how nobody suggests Vallejo Model Color's Dark Yellow for painting German tanks (which of course were painted Dunkelgelb at this point), but various other things. And they are right, because Vallejo's Dark Yellow is a weird, weird colour with too strong a green tint. 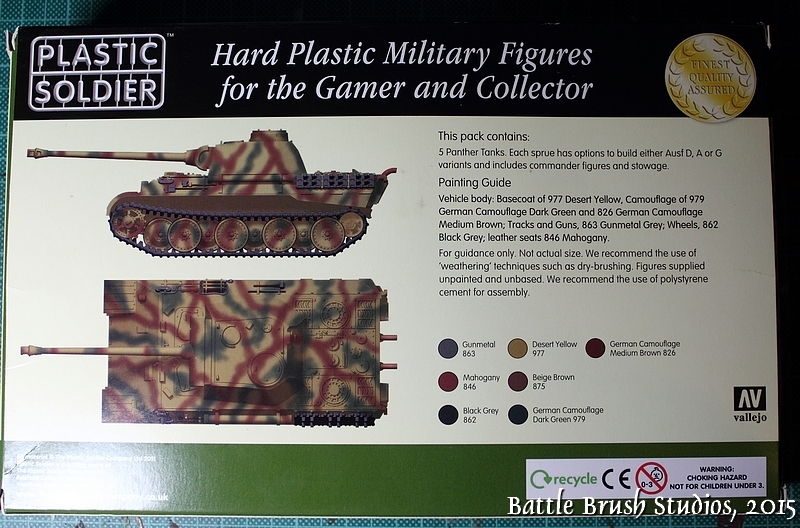 This kit was produced in 2011, so no mention of the Battlefront rules yet. Let's rip 'er up and feast our eyes on the innards spilled before us! In true PSC fashion we get five identical sprues, each sprue holding a full tank model with all variant bits on it. As mentioned before, rather large for PSC standards, mostly due to two different hulls being included. 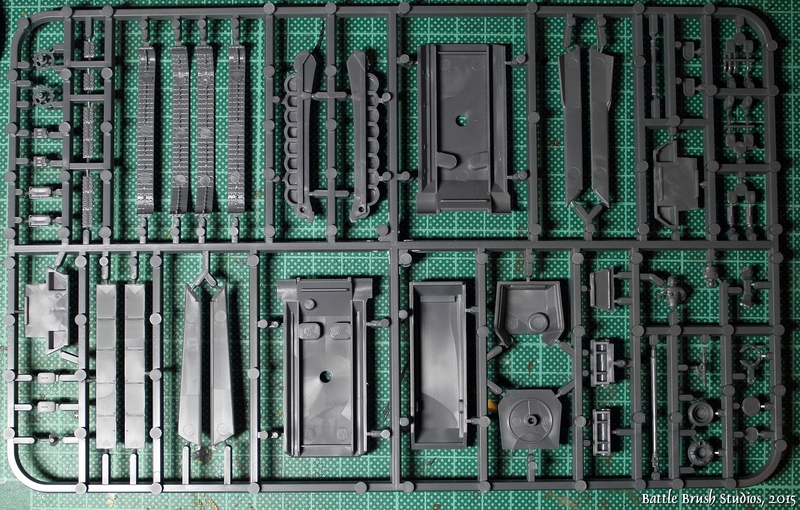 The sprues are of the usual high quality. There are two crew figures included: a commander and a driver (even though you can cut up the driver a little and have his head sticking out of the commander's cupola of course). Surface details on the hull are well done. The tubular thing you have to glue to the side of the hull contains cleaning equipment for the main gun. On the last production series of Ausf.G this was placed across the back of the hull, by the way. The tracks are two-piece each side with the wheels and tracks being separate parts. 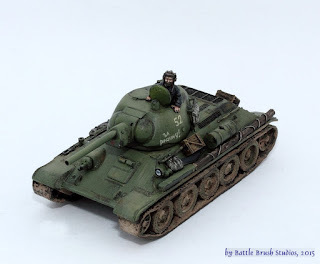 The latest PSC tank kits I believe have wheels and tracks as one part, and some older kits actually got upgraded with extra sprues adding one-piece tracks-and-wheels bits. I will get back to this on a review in the near future. 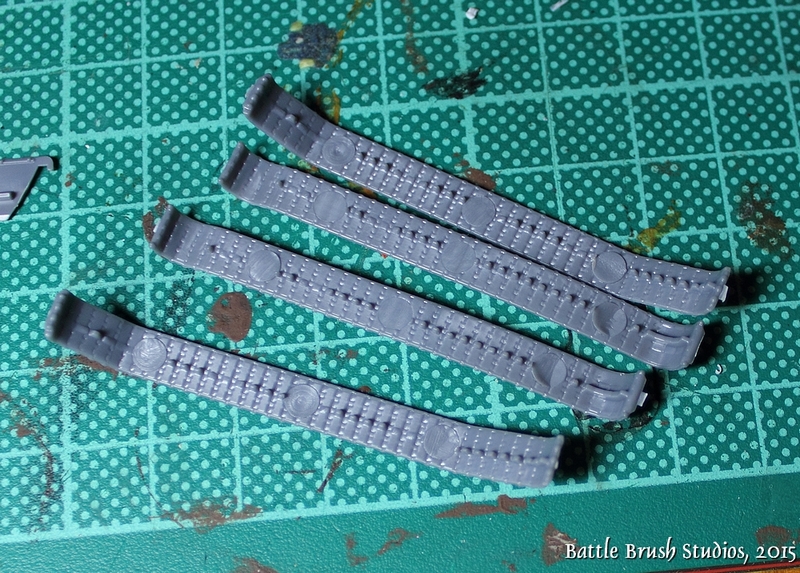 For now I would like to point out that I actually prefer to have the tracks as separate bits for painting purposes. Painting tracks which are cast onto the wheels is just a pain in the rear. It's an A4-sized sheet. 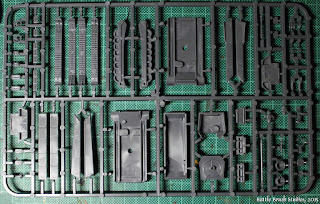 On one side we see a picture of a sprue with colour-coded bits showing which parts are being used for which version of the vehicle. As you can see there are lots of bits not used no matter which version you build. On the other side we get simple assembly instructions. All rather clear and easy to understand. 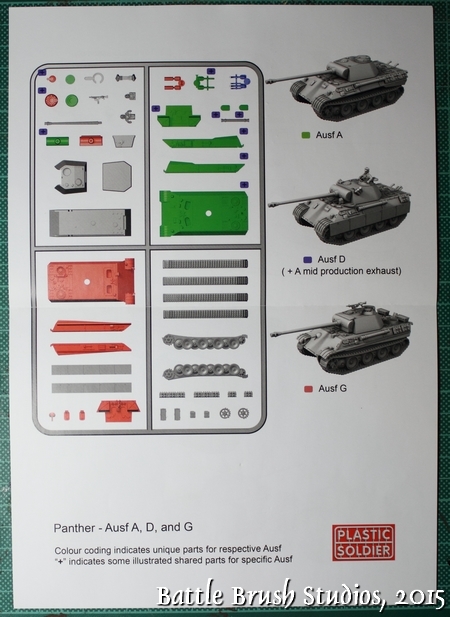 There are some additional stowage items on each sprue: 2 Jerrycans, two additional boxes for the back and some track links which often were used to improve the Panther's slightly thin side armour. The differences between the three variants aren't quite as clear-cut as presented in the instructions though. 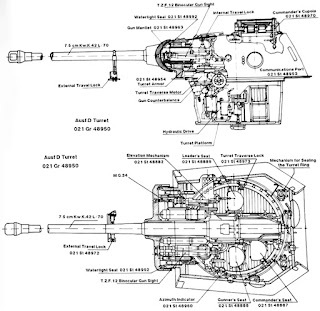 For example early Ausf.G didn't have the Flammvernichter. This isn't just a word someone in Japan made up for the boss monster of their RPG video game, it'ss also the thin sheet metal hulls around the exhausts as these tended to get really, really hot to the point they would literally glow and, if in contact with something flammable, will lead to some flames. Which of course gives away positions in the dark and generally is something to be avoided. Early Ausf.G also didn't have the additional armour at the bottom of the gun mantlet. On the other hand, Ausf.A I think always had the hull MG on the radio operator's side, other than in the PSC instructions here, and later lost the driver's vision slit. Other than that I think the models are historically sound. I think there were some minor differences about the wheels and I assume the tracks got a bit wider at some point, but I'm not sure on that. As mentioned before - the instructions are very clear, making assembly quick and easy. Just be careful when cutting the gun out of the sprue. It's more delicate than it looks. The parts fit nicely, mold lines are present as always and have to be removed, but they're not too bad. I found adding driver figures to the models to be really hard, as it would make it impossible to rotate the turret. Guns are in fixed position and can't be moved up and down. The mounting for the Anti Air MGs on the commander cupola looks rather weird, but making it (and the whole MG really) that sturdy is a necessity when you want gaming pieces I assume. Now here we got the kitties all put together (all except one built as Ausf.G). 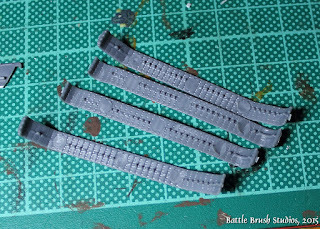 Here's what I left off for ease of painting: Track bits for extra armour (painted on sprue lateron), tracks altogether. I also kept off stowage boxes in the back, but I might add these back on prior to painting. I also didn't glue the hull tops to the lower halves with the wheels and such, otherwise it would be quite a load of work to add the tracks. The turrets are just stuck on and are removable for painting and of course lateron for rotating them. Rest assured that these will be virtually invisible in the end, but make sure to cut them flat where required. 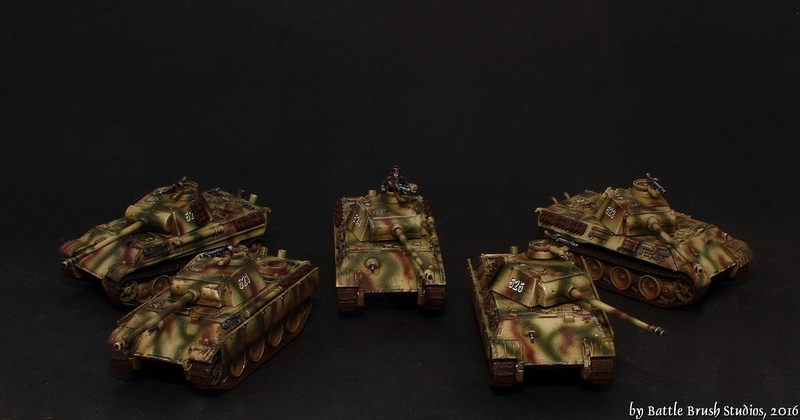 Believe it or not, this was the first time I painted three-colour camo German tanks in 15mm. 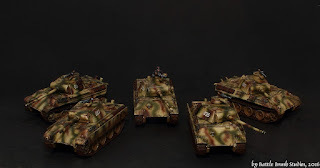 At first I considered painting on the camouflage patterns by hand or using pasticine for masking, but in the end I just airbrushed the pattern onto the vehicles. My reasoning was mostly the fact that I had about 20 vehicles to do and airbrush would just be the fastest way to do it. As far as I remember (no, I'm not that old you jokers. :p As far as I remember reading about it. ) German combat vehicles left factories painted Dunkelgelb (dark yellow) from 1943 on. If you feel like getting into online arguments with strangers just go any place and mention Dunkelgelb, preferrably that you found 'the correct' way of painting it. Camouflage paint was added in the field, by means of mops, paintbrushes, rags, tree branches, sponges and so on. I'm not 100% happy with the look of the camo, but I think it worked out alright. The decals I got from a Battlefront blister of German tank decals. Afterwards I noticed some little details I still need to paint, but overall they're done. I'd like to experiment with adding some tree branch camouflage (seemingly extensively used on the Western front, especially as the Allies got air superiority and the German army was exclusively on the defensive). As you can see I put some Schürzen extra armour on two of the vehicles and on top of using track links for additional extra armour on the sides I also cut some up and put them on the sides of the turret on some vehicles. So what do I think of the kit? As usual with PSC models the casting is really, really nice, details are a-plenty, there even are some basic stowage items, two commander figures. 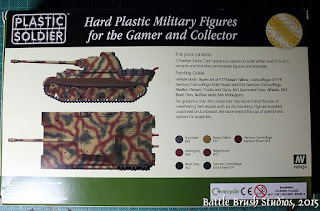 The only thing I wish they'd also include is decals, Especially with boxes containing multiple vehicles a small decal sheet would come very handy. Just a selection of turret numbers and Balkenkreuze. 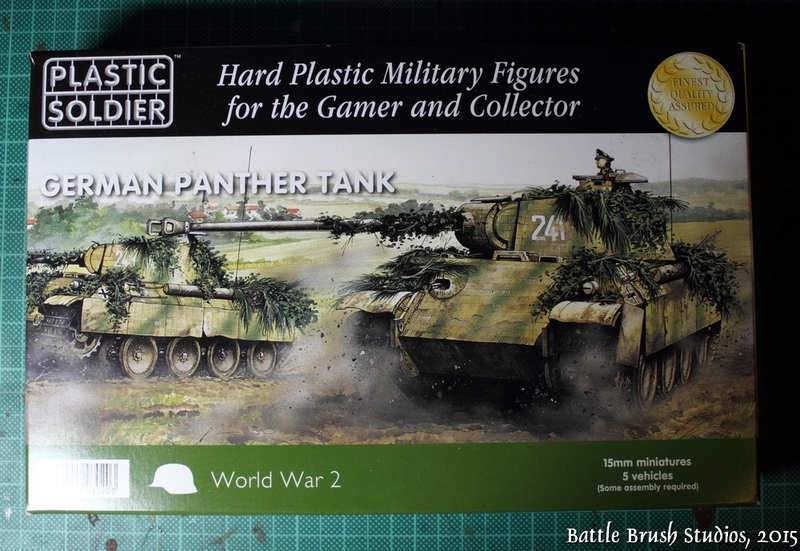 A box contains a full platoon of Panthers, so five vehicles, for abour GBP 20.00. Single vehicles are available as well from PSC directly at GBP 5.50 a piece, making them still a better deal than the Battlefront vehicles. I haven't had the Forged in Battle Panthers in hand, so I can't say much about them. A pack of three (with base cast on) costs also roughly GBP 20.00. Painting taking much longer than anticipated and having to resist gluing everything together in one go (you'll be glad you didn't later!) aside, this is a very solid model kit. Probably my first pick when it comes to 15mm sized Panther models. Nice write up,background info and very nice paint job on those Panthers.